This 100% acrylic six panel officially licensed US Air Force cap features an embroidered Air Force text logo on the front. 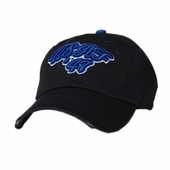 The curved bill has a distressed look to give it that vintage feel. The slide-buckle closure makes this cap one size fits most.